Aim: The repair of a hiatal hernia presenting with reflux disease and a standart fundoplication via single incision with out any assistance of any other port. Methods: A 29 year old male patient who had reflux symptoms had undergone an upper gastrointestinal endoscopy which reveiled Hill grade III-IV hiatal insufficiency and a 4 cm sliding hiatal hernia. 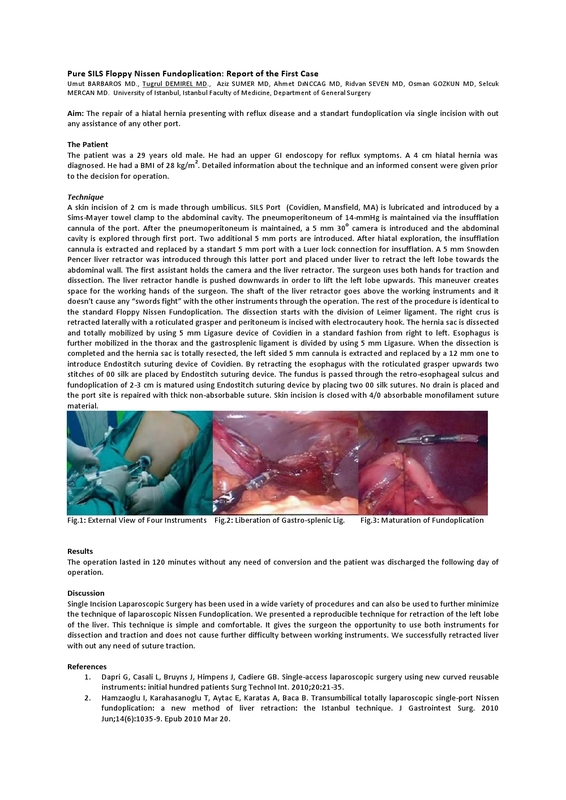 A standart crural repair without a mesh reinforcement with a standart Floppy Nissen Fundoplication with the mobilisation of gastro-splenic ligament via a single 2 cm umblical incision by using a special port. Results: The operation time was 120 minutes and the patient was discharged on the first postoperative day. The whole procedure was performed from the first incision to the wound closure through a umblical single incision of 2 cm. No any other ports were needed for retraction of liver or recontruction of the fundoplication. Conclusion: Single Incision Laparoscopic Surgery has been used in a wide variety of procedures and can also be used to further minimalise the technique of laparoscopic Nissen Fundoplication.